If It's Too Loud...: The Wave Pictures - "Pool Hall"
The new single from The Wave Pictures strikes pretty close for us all in the Boston we've lost a ton of legendary music venues in the last couple of years, so a song about losing a beloved hangout to development strikes a chord with us. "Pool Hall" is this groovy 90s tinged indie rock song. Dave Tattersall's vocals come across like a crooning Stephen Malkmus or a less rock star version of Jarvis Cocker. It's a chilled out, bluesy sound that is really unique in the world of indie rock, and I'm really looking forward to hearing more from these guys. The upcoming album from The Wave Pictures, Bamboo Diner in the Rain, will be out November 11 on Moshi Moshi. You can watch the video for "Pool Hall" below. 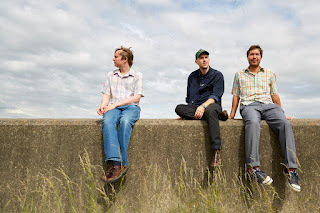 For more information on The Wave Pictures, check out their website and Facebook. You can pre-order Bamboo Diner in the Rain here.